Sreznevsky Ismail Ivanovich (June 01 (13), 1812 – Feb 9 (22), 1880) – Russian Slavic scholar. At the beginning of a creative way also acted as a Ukrainian poet and folklorist. He was born in Yaroslavl in the family of professor. In the same 1812, his father was transferred to Kharkov University, where Ishmael lived until 1847. In 1826 he entered the Kharkov University and finished it in 1829. From 1837 he taught at the same university; in 1839 – 1842 traveled with scientific purpose a number of Slavic lands. On return he became a professor of Slavic studies at Kharkov University. In Kharkov period he was inspireator of the group romantic poets and himself wrote Ukrainian poetry. Forces group published "Ukrainian Almanac" (1831), which was an important milestone in the development of Ukrainian poetry. 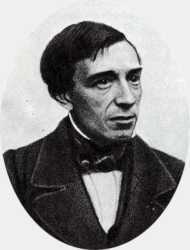 Folklore interest Sreznevsky resulted in the publication "Zaporozhskaya antiquity" (1833 – 1838, 3 vols.). Two issues of "Ukrainian sbornyk (collection)" (1838, 1841), prepared by Sreznevsky contained first publications of works Kotliarevsky – "Natalka Poltavka" and "Muscovite Wonder". Decisive in his career was the transition to the post of professor of St. Petersburg University (1847), where he worked until his death. From 1851 he was a member of the St. Petersburg Academy of Sciences, editor of its publications in the Russian language department, prepared a large number of Slavic scientists. During this time he worked out history of Russian language, paleography, published numerous monuments of ancient Russian literature, worked at the ancient language dictionary (published posthumously in 1890 – 1912 under the title "Materials for ancient Rus' dictionary by written monuments of language").